In your LightArrow app, there are several options for contacts management beyond what the built-in app on your device provides. For example, for your contacts, you can manage names, comments, birthdays, anniversaries, events, projects, tasks, appointments, trips, visits, notes, phone numbers, email addresses, cities, streets, states, zip codes, timestamps, reminders, expenses, device emails, device phone numbers, job titles, nicknames, and companies. In addition, you can add your contacts to contact groups so they’re better organized. This is particularly useful for those who manage a lot of contacts as clients or those who are in sales. All of the contacts can be viewed in a spreadsheet-like grid view, which allows you to easily edit their information. For example, if you’re planning an event, you can easily see all of the invitees in the Contacts view in a spreadsheet-like table — which makes event planning a breeze. And keep in mind that LightArrow provides integration with your iOS contacts so information can be easily shared between the two apps. You can also easily contact the people who you’re managing in your contacts via phone, email, Facebook message, Twitter, SMS, or Email. In addition, you can view their latest Facebook messages and Tweets without leaving your LightArrow app. Note: Many advanced contact management features are available via the Pro Contacts in-app purchase. Before you start adding contacts, it’s a good idea to create contact groups so you can better organize your contacts and add multiple contacts from your iOS calendar all at once. For information about creating contact groups, refer to People + Services. You can associate contacts with many items in your LightArrow application. The Contacts view appears when you’re adding contacts to an item, such as an event. You simply tap the contacts you wish to include and then tap Save. When you’re managing contacts from the People + Services topic, the Contacts view provides a table view and a grid view for managing contacts. The table view includes a list of all your contacts in alphabetical order. In this view you can add new contacts; open contacts; communicate with contacts via phone, email, or text; and delete contacts. Also, you can export the contacts to a call list by tapping the action button and then choosing the option to export to call list. When you open contacts, you have more options, such as viewing all their Twitter and Facebook social media posts and managing the data for the contact. Seeing social media posts in one view makes it easy to get a complete picture of the person you’re communicating with — and eliminates the need to open several different apps to collect this information. To see your contacts in a spreadsheet-like view, called a grid view, you tap the icon shown in the upper right. All of your contacts are listed in rows, and you can change the data for many of the cells by tapping the cells and changing it directly. You can choose the data that is shown by tapping the Filter icon. 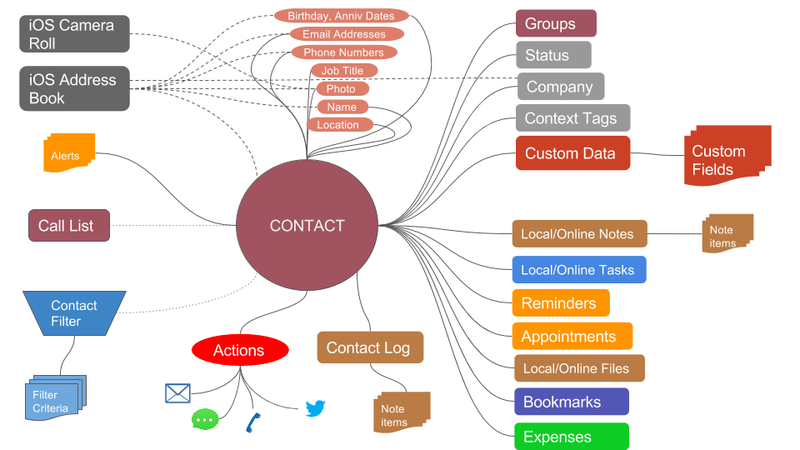 The data you can view includes: Name, Comments, Groups, Birthday, Anniversary, Events, Projects, Tasks, Appointments, Trips, Visits, Notes, Phone, Email, City, Street, State, Zip, Timestamp, Reminders, Expenses, Device Email, Device Phone, Job Title, Nickname, Company, and/or any custom fields. You can also group the data by context tag, birthday, last updated, anniversary, group, state, city, zip, last name, or company by using the control in the upper left. If you wish to add a new contact, tap the plus sign in the upper right. Note: You can also contact the person or business directly from the cells by tapping the data items. You can add contacts directly to your LightArrow app and choose whether or not to add the contact to your iOS contacts. In People + Services, tap the plus sign. Add the details, such as a name, job title, and company or tap Import from iOS Contacts to obtain the details from your iOS contacts. If you want to add more detail, tap Create and Add More Data. Tap the available tiles to add more detail, such as phone numbers, email addresses, birthday, anniversaries, groups, context tags, location, and social media links. Sometimes you might want to create a contact and link it to one of your iOS contacts. You can always unlink it later by following the same procedure below and tapping Unlink from iOS Contact. When you link a contact to one of your iOS contacts if the the job title and company are specified that information will show in the contact after it’s linked. Locate the contact by tapping the Contacts tile or the Groups tile. Tap the contact and then tap Open. Tap iOS Contact, and then tap Link with iOS Contact. Choose a contact and then tap Save. If you wish to change the information for a contact or add details to it, follow the procedure below. After you locate the contact in the list, tap it and then tap Open. Modify any of the information by tapping the fields or tiles, and then complete the available fields. After you add and save a contact, you can add a photo to it that shows in the tile for the contact to help you quickly identify the person or other entity. If your contact already has a photo associated with the contact in iOS, and the contact in your LightArrow app is associated with an iOS contact, then the photo shows in the tile, by default. After you locate the contact in the list, tap it, and then tap Open. Tap Add Photo in the upper left corner, and then choose an option to take or select a photo. When the photo has been added, tap Save to save the contact. You can add a company to your contact by following the procedure below. To add the job title, tap Title and type the title. To add the company, choose a company that’s been created (once they are added, they are available for selection for all contacts) or tap Add to add a new company. In the New Company view, set the name of the company, and then add an optional description and URL by tapping the respective fields. Tap Save. The company is added to the contact and is now available for selection for other contacts. You can tap Status field and select the status from the list. You can also create a new status by tapping on the New button. Tap the Contact Statuses tile. From the New Contact Status view enter the contact status name. Tap the contact status that you wish to update to expand the row, and then tap Configure. Tap the contact status that you wish to delete to expand the row, and then tap Delete. You can add a primary and secondary phone number to a contact by following the procedure below. Tap the Phone Numbers tile. You can add a custom Primary Phone to the contact by typing it in the Custom Primary Phone field (this does not need to be shared with your iOS contacts – it can be stand-alone in your LightArrow app). Secondary phone numbers from the associated iOS contact are listed below the Custom Primary Phone field. You can choose the primary phone number by tapping it and then tapping Save. Continue by editing other information for the contact or tap Save to close the view. Tap the Phone Numbers tile, type the numbers, and then tap Save. Tap the Personal Dates tile, and type the birthday and anniversary dates, and then tap Save. Tags are used to organize information. In the Getting Things Done® (GTD®) methodology developed by David Allen, Contexts are typically based on a physical location, resource, or the equipment that’s necessary to complete a task. Examples of Contexts are office, home, grocery store, etc. Productivity is increased when you’re not “switching contexts.” For example, you’re more productive if you return phone calls during blocks of time, rather than switch to a different task — such as graphic design or coding. If you’ve assigned context tags to items such as contacts, you can view the items directly from the My Contexts view of the Dashboard. This allows for quick access to these items. Then tap More, and select Tags. Choose tag(s) and then tap the back button. Full Address: Allows you to type a full address for the item. Set Location to “Here”: Sets the location to the nearest location. Specify/Show on Map: Searches for the location and chooses it or sets it to a typed position. Clear Location: Removes the location. Show Nearby: Shows the Near Me view so you can view items near to this location. When the map appears with the pin in the correct location, tap Save. You can add social media handles for Twitter and Facebook directly for the contact. This is useful to learn more about your contact (from one place) before starting a conversation with them. Tap the Social tile, and then tap Configure Ids. For Twitter, type the user’s handle or use the search to find the person. For Facebook, type the user’s id (found on the Facebook URL bar) or use the search to find the person. If you no longer wish to include a contact in your LightArrow app, you can delete it. If you delete a contact from your LightArrow app and it is linked to an iOS contact, then you should also delete the iOS contact if you no longer wish for it to be accessible from your device. There are several ways to delete contacts, which are described below. Locate the contact’s tile by tapping the Contacts tile or the Groups tile. Locate the contact in the list, then tap More. Select Delete and confirm the deletion. You can add and edit contacts in a spreadsheet-like view for faster editing. Tap the grid icon in the upper right below the plus sign. Group the contacts in the way you wish to view them by choosing Ungrouped, Context Tag, Birthday, Last Updated, Anniversary, Group, State, City, Zip, Lastname, Company, or any custom value. If the contacts are grouped, tap the group’s name. Tap inside any cell to modify or add information. Tip: If you wish to hide any of the columns in the grid view, tap the Filter icon. Tip: If you wish to search for contacts in the grid view, tap the Search icon and type a search term. When you tap Show All Associated Items, the app shows all data items that are BOTH contained in the contact, as well as data items that are associated otherwise (for example, when that contact is a task owner, but the task is not necessarily contained in that contact). For example, imagine you added Task A to a contact and separately made that contact the task owner of Task B. Then, Show All Associated Items will show both tasks. Grouping by Association, Type, etc., gives you more insight on why the various items display. However, the icons in the Associated Items section only have a badge count (and show) the items directly contained in the Contact, so in this case, only Task A appears. Refer to People + Services for information about creating custom fields for contacts. For more information about interacting with contacts, refer to People + Services. Create the file as described above. Email the file as an attachment to an email address that you can access from the default email program on your Apple device. Open the email by using your Apple device. Tap the file download in the email, and then tap and hold it. Choose your LightArrow app from the list of apps that appear to import the list. Accept the download in your LightArrow app.